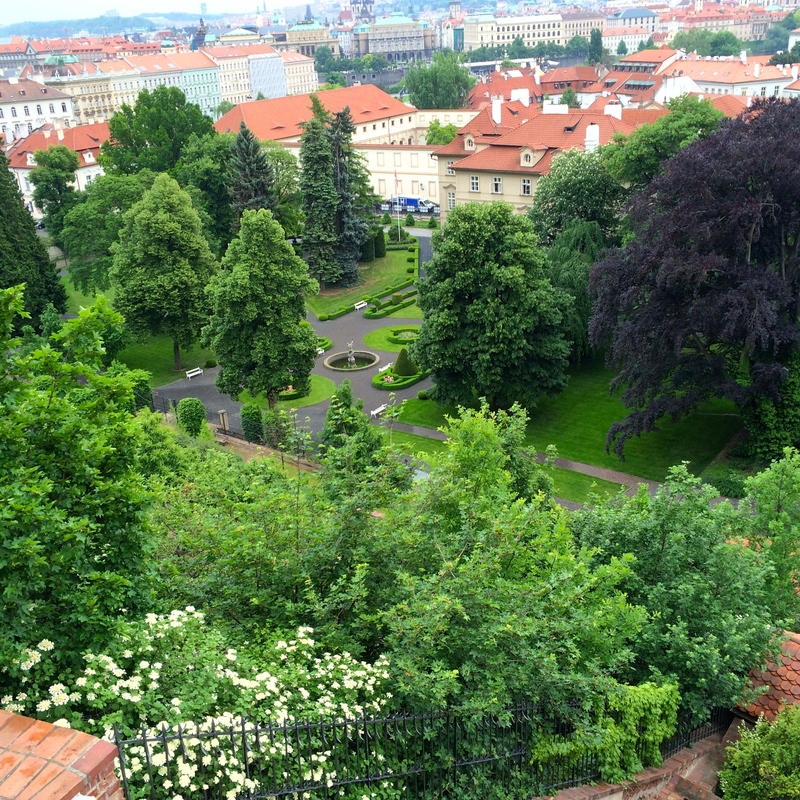 It’s my last morning in Prague and I thought I should see the castle . 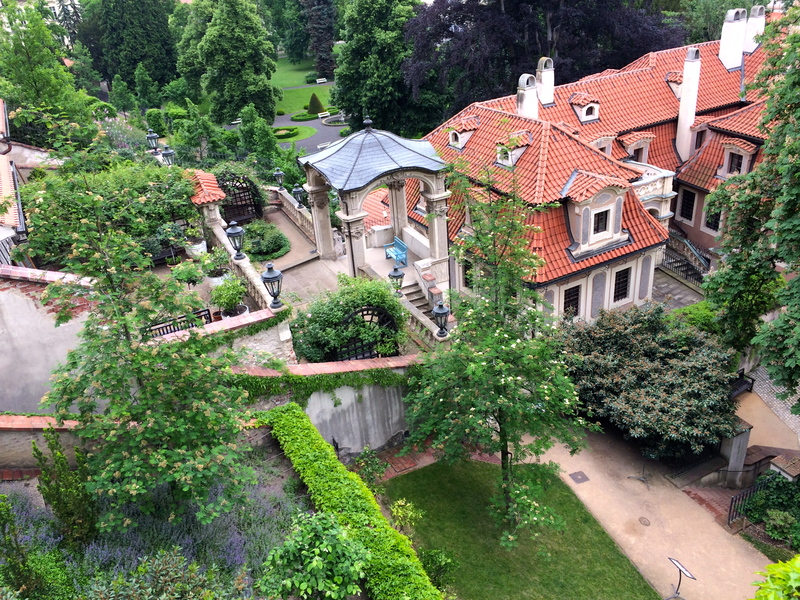 The walled castle complex is ginormous and stretches along the whole top of that picture above (on the far right is the St. Nicholas cathedral, which isn’t part of the castle complex). Plus it’s on top of the tallest hill in a city of pretty impressive hills. Seemed like the proper way to end this trip. But note the pretty blue skies from yesterday in the picture above and the grey leaden rainy skies from today. Boo. 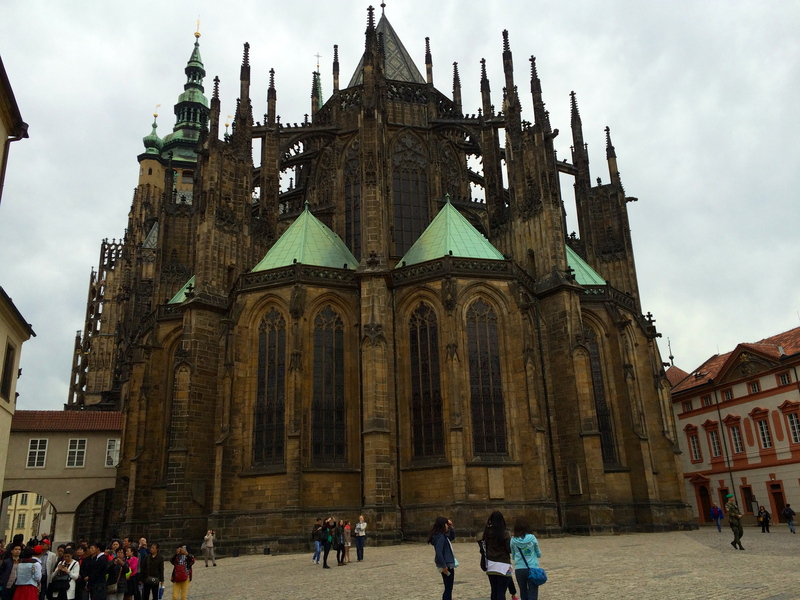 This is the back of St. Vitus Cathedral. I couldn’t get a decent picture of the front because of the size and scale of the building and proximity to other walls and buildings making it impossible to back up the required half mile to get the whole structure in the picture. 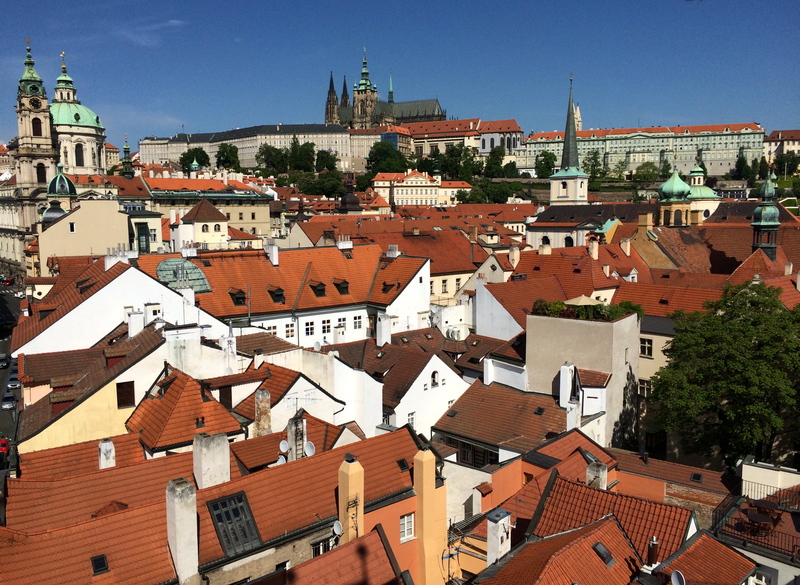 Hereafter this is known as the Prague Photo Dilemma. I was also in danger of getting trampled by approximately 2000 tour groups all shrieking and milling about waving cameras and umbrellas. 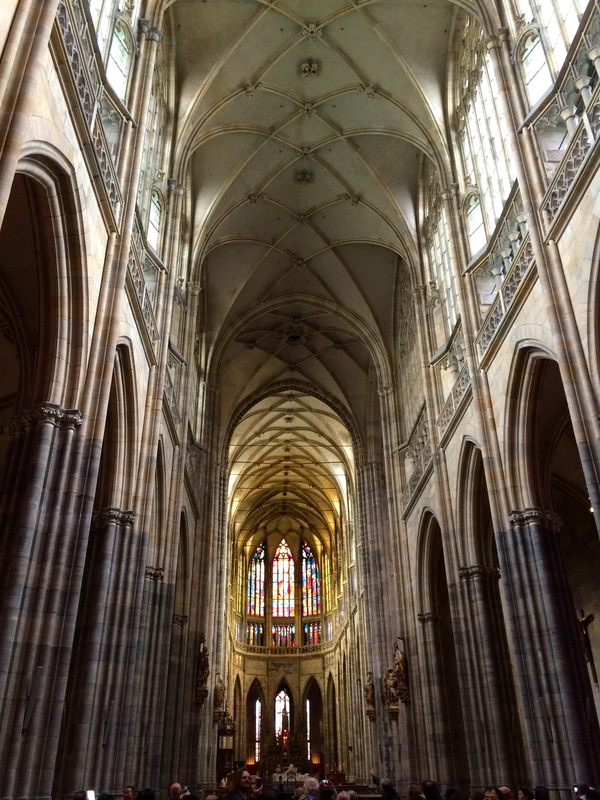 The inside of St. Vitus is gorgeous and gothic and grandiose, all the G’s for which Prague is famous, but this picture is all you get because of the tour groups and my fear of death. 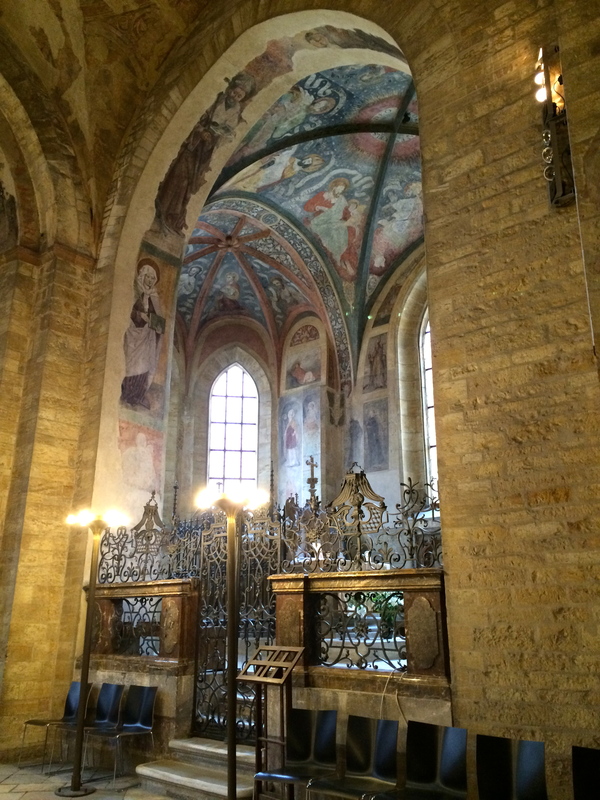 I fled to the much quieter, less grand but still gorgeous St. George’s Monastery where I wish I could have gotten closer to this little chapel with the beautiful ceiling. 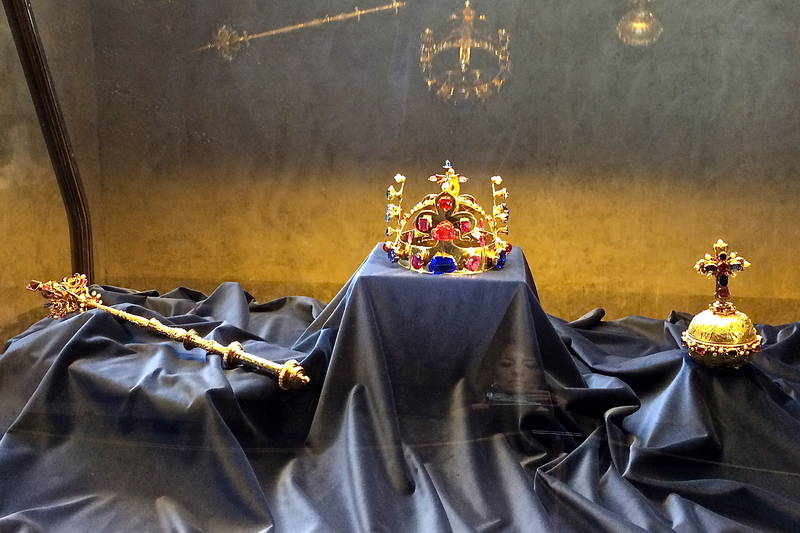 A few buildings over in the royal palace, this crown I wasn’t supposed to photograph seemed worthy of mention. Doesn’t it look like costume jewelry? I do not want to believe those stones are real. And with that, I was castled out. It didn’t take long. 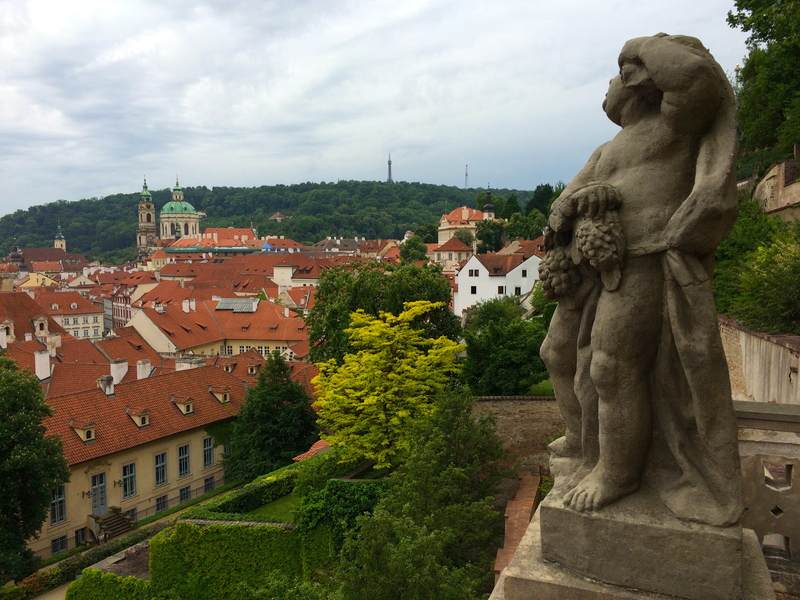 And so I found myself photographing this weary cherub, overcome with his view over rainy Prague when I noticed that all down the hill (mountain, let’s be honest) are terraced gardens that I didn’t know about because my (admittedly terrible) guidebook decided to spend 4 pages on the St. Vitus Cathedral and about 2 lines on the 12 acres of grounds surrounding the cathedral. 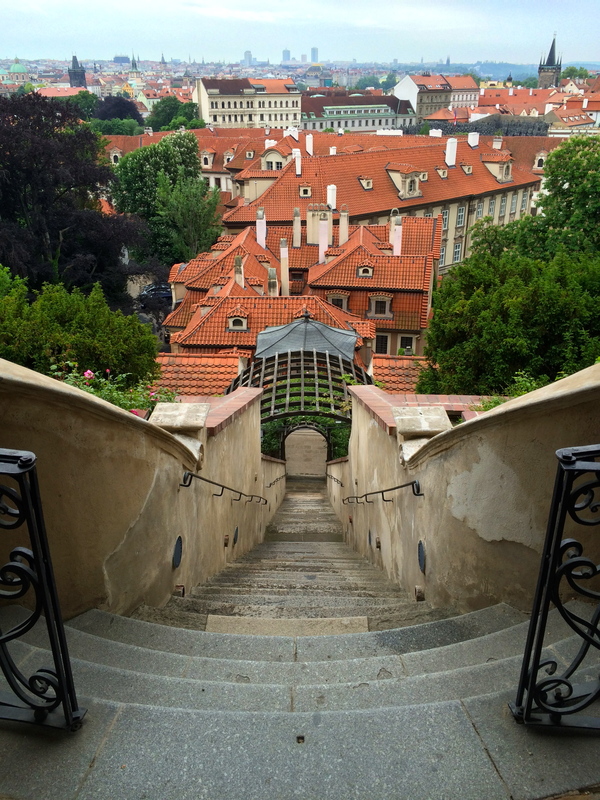 Prague is not for the faint of heart or leg. And you’ll notice a complete lack of safety anything around these gardens. Another thing I love about Europe is their general assumption that I’ll take care of myself. Instead of massive barriers around edges and warning signs that spoil my view, Europeans are all “that unprotected bit over there with the 200ft drop? Do be careful or you could fall to your death. OK, off you go then!” I appreciate that vote of confidence. And on that note, I exited the castle. I’d highly recommend those gardens. I stopped for a fortifying pancake snack and a flat white at the local Starbucks. I really do enjoy seeing the way Starbucks offerings change from country to country. 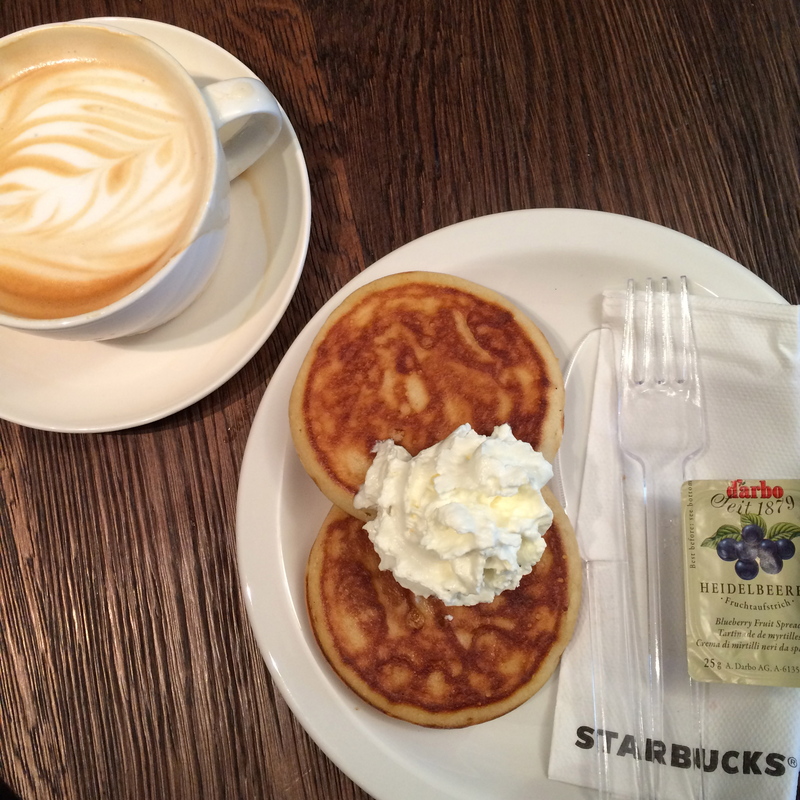 Why doesn’t every Starbucks offer pancakes? 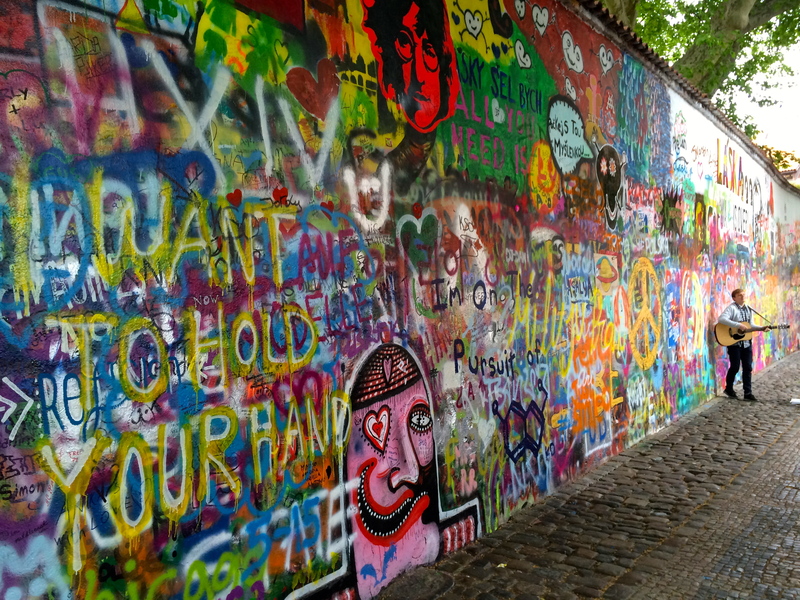 I had a hard time finding this wall… which should come as no surprise. I should have just assumed someone would be playing Beatles songs and followed the music. For years the authorities whitewashed this wall every month or so to get rid of the graffiti and then they just gave up and let the street artists have it. Ok, I’m off to Italy. More tomorrow! 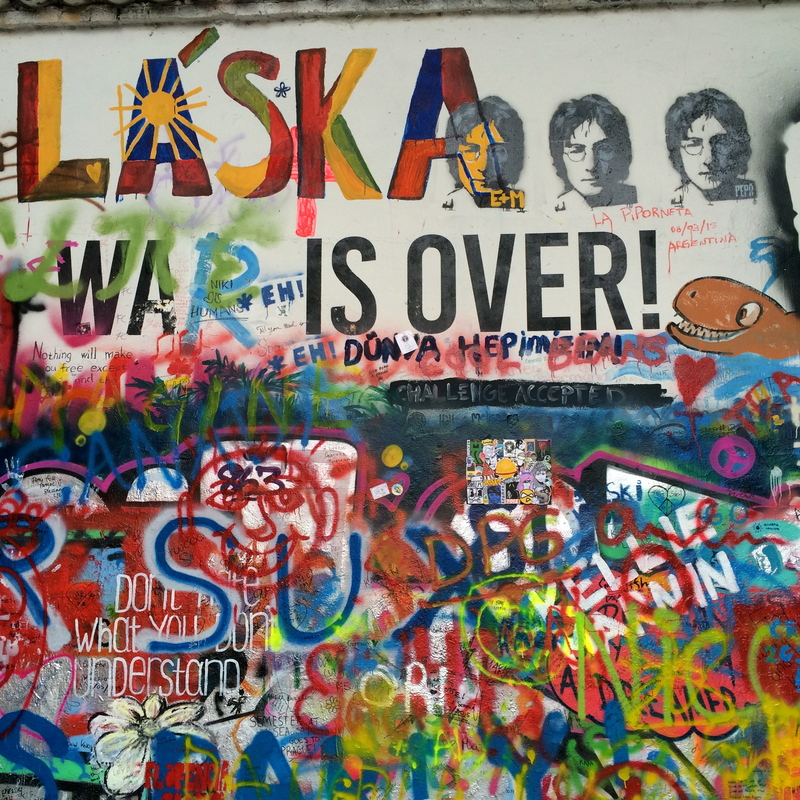 This entry was posted in Czech Republic, Prague, Street Art and tagged all you need is love, Czech Republic, graffiti, John Lennon, John lennon wall, Prague, Prague castle, Prague Street Art, Street art, street tags. Bookmark the permalink.